Size of this preview: 800 × 560 pixels. Other resolutions: 320 × 224 pixels | 640 × 448 pixels | 1,024 × 717 pixels | 1,280 × 896 pixels | 10,000 × 7,000 pixels. English: Wawadit'la with heraldic pole, built by Chief Mungo Martin in 1953 at Thunderbird Park in Victoria, British Columbia Canada. Asturianu: Wawadit'la con un totem heráldicu, costruyíu pol Xefe Mungo Martin en 1953 nel Thunderbird Park, Victoria, Columbia Británica, Canadá. 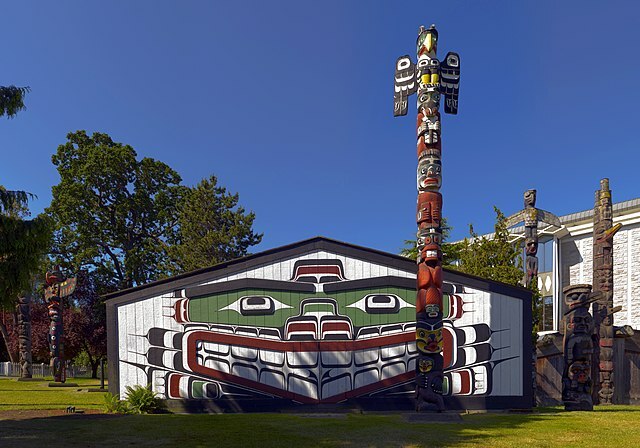 Deutsch: Wawadit'la, ein „big house“ der Kwakiutl, mit Wappenpfahl im Thunderbird-Park in Victoria, Britisch-Kolumbien, Kanada. Español: Wawadit'la con un tótem heráldico, construido por el Jefe Mungo Martin en 1953 en el Thunderbird Park, Victoria, Columbia Británica, Canadá. Français: Les totems érigés autour de la case communautaire villageoise (wawadit’la) ornés de symboles héraldiques, construits par le chef nord-amérindien Mungo Martin en 1953 au Thunderbird Park de Victoria en Colombie-Britannique (Canada). Íslenska: Tótemsúla, reist af Mungo Martin árið 1953 í Thunderbird-þjóðgarðinum í Bresku Kólumbíu í Kanada. Italiano: Wawadit'la con totem, costruito dal capo Mungo Martin nel 1953 e situato in Thunderbird Park, Victoria, Columbia Britannica Canada. Polski: Indiański słup totemowy i Wawadit'la zbudowany przez Wodza Mungo Martina w 1953 roku w Parku Thunderbird w Kolumbii Brytyjskiej w Kanadzie. Português: Wawadit'la é uma casa com um poste totem. Esta localizada no Parque Thunderbird em Victoria, Colúmbia Britânica. Svenska: Wawadit'la med en totempåle, byggt av hövding Mungo Martin 1953 i British Columbia. Беларуская: Дом "Вавадзіт'ла" і татэмны слуп, збудаваныя Мунга Марцінам у 1953 (Тандарбёрд-Парк, Брытанская Калумбія, Канада). Русский: Wawadit'la с тотемным столбом, построенный вождём Мунго Мартином в 1953 году в Тандерберд парке в Виктории (Британская Колумбия, Канада). Українська: Індіанський тотемний стовп та «Вавадітла», на мові індіанців племені квакіутл — великий дім. Збудовані вождем Мунґо Мартін 1953 року у парку-музеї Thunderbird, що у м. Вікторія, Британська Колумбія, Канада. This is a retouched picture, which means that it has been digitally altered from its original version. Modifications: This image was created by stitching together 28 images taken at different angles. Saturation, brightness and contrast adjusted. White balance adjusted from RAW..
English: Wawadit'la, also known as Mungo Martin House, a Kwakwaka'wakw "big house", with heraldic pole. Built by Chief Mungo Martin in 1953. Located at Thunderbird Park in Victoria, British Columbia. Français : Wawadit'la, ou la maison de Mungo Martin, une "Grande maison" des Kwakwaka'wakw, avec ses totems. Monuments construits par le chef sculpteur Mungo Martin assisté de David Martin et Mildred Hunt en 1953 à Thunderbierd park, Victoria, en Colombie Britannique.